Your TeamViewer full version will automatically download in a moment. If the download didn’t start, use direct download. Be one of the early adopters of TeamViewer 14 and provide a new level of service to your customers and employees. Did you know that TeamViewer has integrations for over 10 other software solutions? 100% FREE for personal users! If you’re a student or are using TeamViewer to help friends and family, it's completely free FOREVER. You’ll never be charged. Considering TeamViewer for your business? Get the license that best suits your needs today! Check out these quick start steps to get the most out of the world’s only all-in-one remote connectivity platform. To provide support: Install TeamViewer full version on your computer, then enter the client’s TeamViewer ID and password to connect to their device. 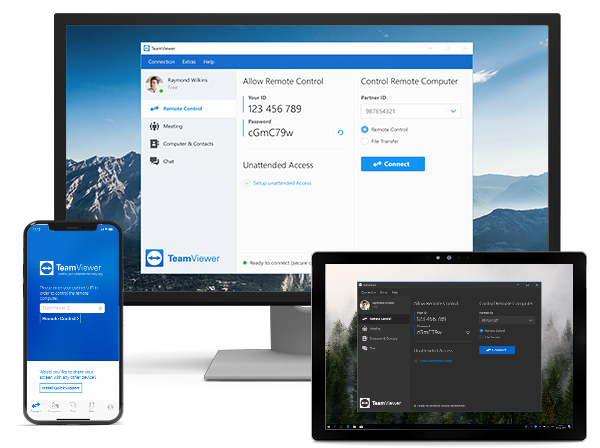 To receive support: Download and install the TeamViewer QuickSupport app on your computer, then share your TeamViewer ID and temporary password with the support person. Install TeamViewer software on the computer you need to access and set up unattended access from the Connection menu. Set a computer name and access password for the remote computer. Install TeamViewer on the accessing computer and add the remote computer to your Computers & Contacts list. Select the remote computer from your list, click ‘Remote control using password,’ and enter your password to connect.